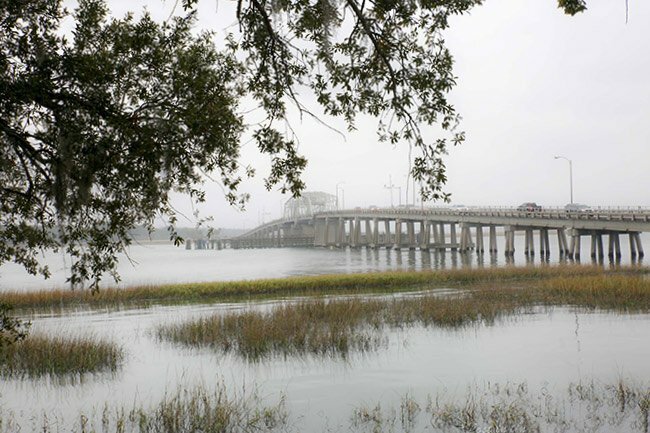 The Woods Memorial Bridge is one of Beaufort‘s most notable landmarks. 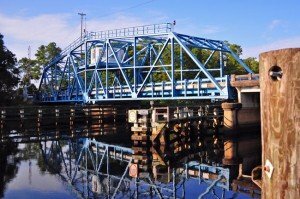 This swing bridge is one of just a handful of moveable bridges left in South Carolina. 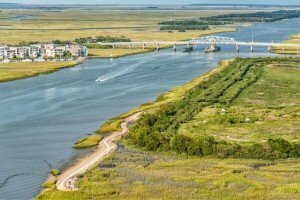 It was named for Richard V. Woods, a South Carolina Highway Patrol officer killed in the line of duty on August 15, 1969. 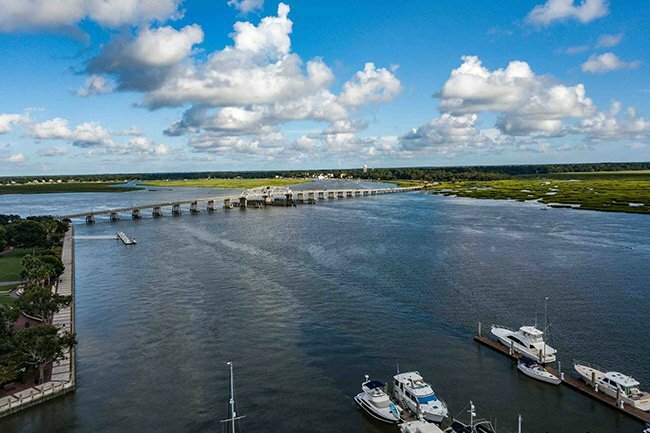 It opens hourly for boats and barges traveling the Intracoastal Waterway. 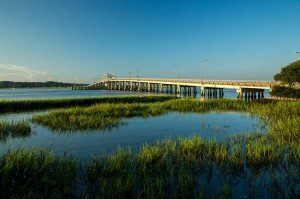 People who have never been to Beaufort may have seen the Woods Memorial Bridge; it was briefly featured in the film, Forrest Gump, as a bridge crossing the Mississippi River. 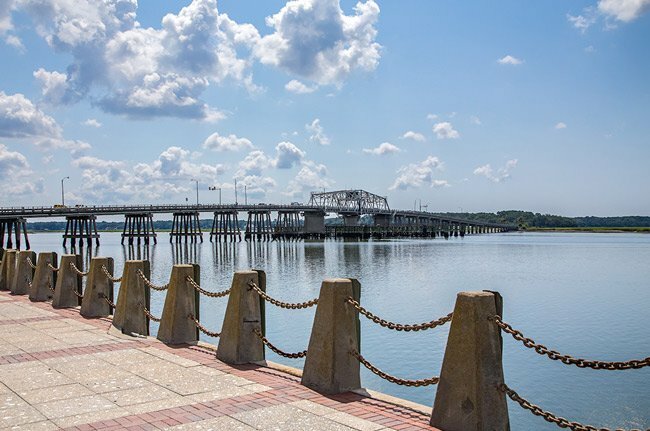 The structure can be seen from the Henry C. Chambers Waterfront Park, a newly-renovated area along Beaufort’s riverfront. Draped with shady oaks, it provides a beautiful place for passersby to relax on riverside swings, play a game of Frisbee, listen to a concert, watch an outdoor movie, or enjoy a meal at one of Beaufort’s many restaurants. 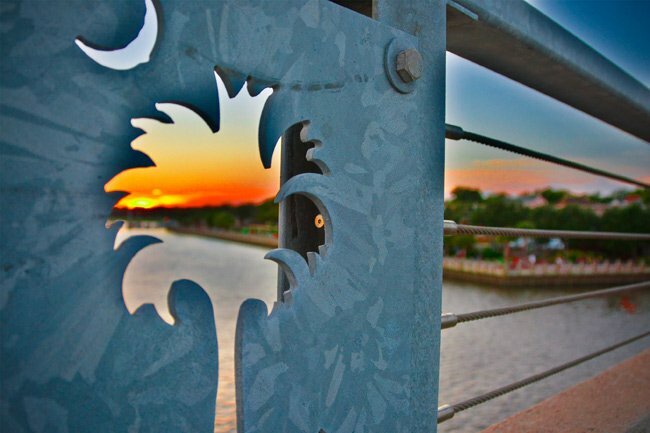 A detail of a palmetto tree along the rail of the bridge depicts the South Carolina state flag. 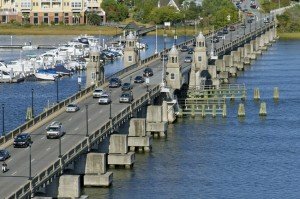 It is an artful reminder to those crossing the bridge that Beaufort is the state’s second oldest city, after Charleston. 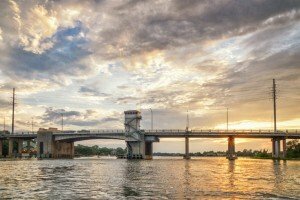 The photo below was taken from the vantage of Cannon Park, located near the north end of the Woods Memorial Bridge, opposite the Waterfront Park. 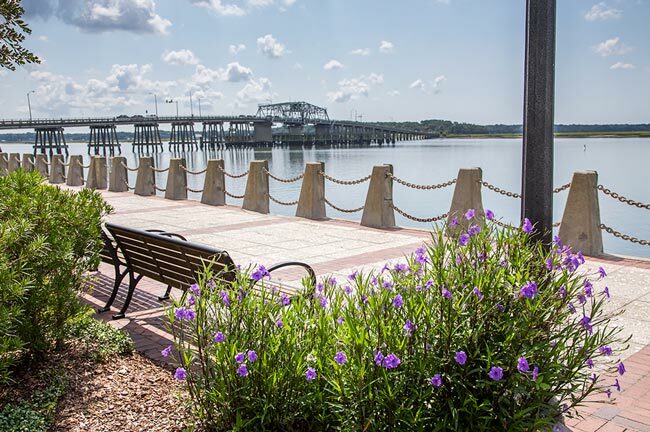 The small park is adorned with flowers, and visitors enjoy relaxing on benches and watching boats pass beneath the bridge. 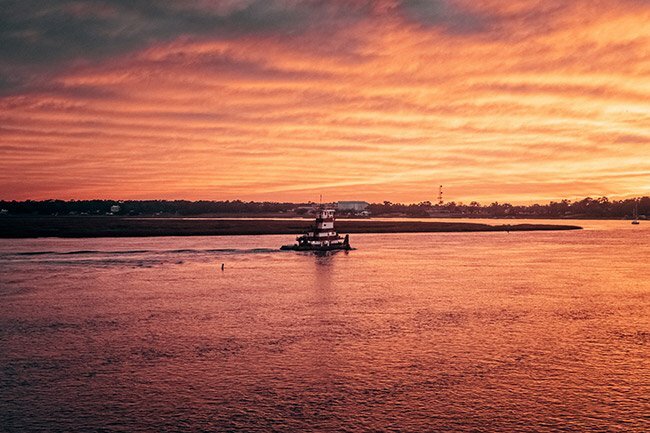 Cannon Park is treasured by locals who enjoy the quiet respite it offers. 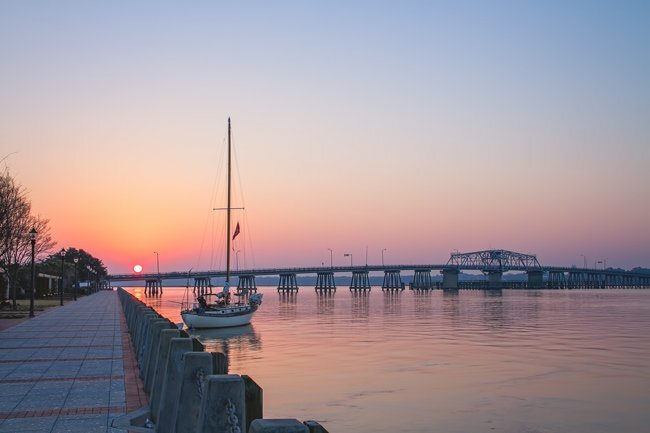 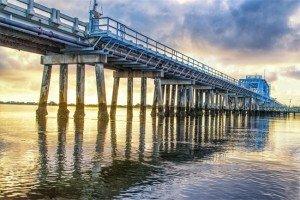 No matter where you view the Woods Memorial Bridge, the structure is a visual treat complementing the surrounding beauty of downtown Beaufort. 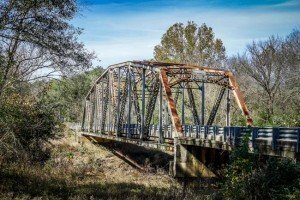 From its steel beams shining in the distance to its charming details, this moveable bridge has earned its place as a beloved South Carolina landmark. 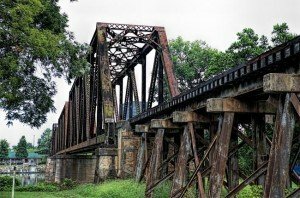 What are the rules regarding cylinders for vehicles going across the Woods Memorial swing bridge? 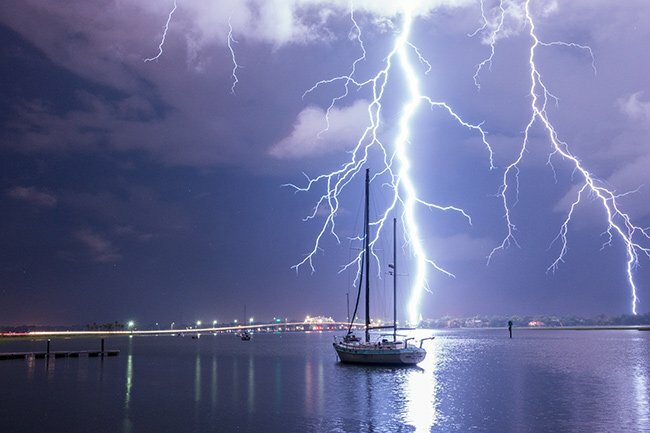 I thought large multi-cylinder vehicles were prohibited!